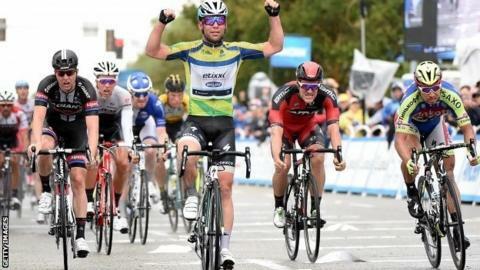 Mark Cavendish sprinted to his third stage win on a rain-soaked fifth leg of the Tour of California. The Briton followed Giant-Alpecin's Zico Waeytens in the last kilometre after his Etixx - Quick-Step team-mate and lead-out man Mark Renshaw faded. "It was a headwind finish and I didn't want to jump early," said Cavendish. Waeytens finished second while third-placed Peter Sagan earned bonus seconds to reduce Toms Skujins' lead in the overall standings to 18 seconds. Cavendish won the 154km race from Santa Barbara to Santa Clarita in three hours, 51 minutes, 37 seconds. Friday's 10.6km time trial has been relocated from Big Bear Lake to Six Flags Magic Mountain in Santa Clarita, north of Los Angeles, because of snow. The eight-stage race finishes on Sunday in Pasadena.